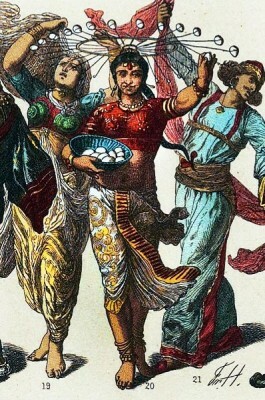 Home » The Egg Dance at the court of Bhopal. ‘Le Tour du monde en quatre-vingts jours’ by Jules Verne, 1873. Illustration by Émile-Antoine Bayard for the first edition of the book ‘In 80 days around the world’ at the 30. january 1873, by the French writer Jules Verne. 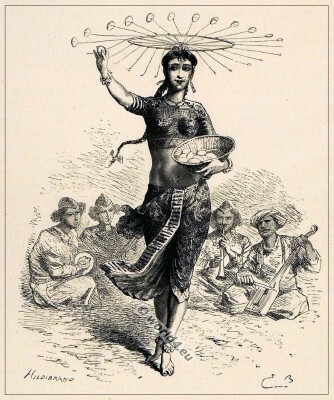 The image was published again a few years later, 1884 in the book, ‘Costumes of the peoples of the world’ by the German Friedrich Hottenroth (1840-1917). 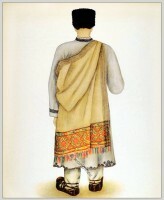 He was a traditional costumes researcher, lithographer, painter and author. Different versions of this image have been circulated by other artists. In modified form it is found also on cigarette advertising. 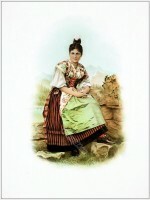 Émile Bayard, born in 1837, was a French illustrator. He mainly worked after his studies at the École des Beaux-Arts for magazines and later continued in his drawings, paintings extensively with the war between Germany and France apart. After the advent of photography the orders of documentary drawings were less until they finally were dropped. He illustrated books such as Les Misérables by Victor Hugo, Uncle Tom’s Cabin by Harriet Beecher Stowe and many more. He died on 6 December 1891 in Cairo. 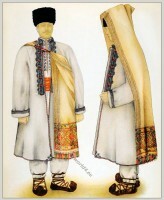 eBook: India and its native princes. Travels in Central India and in the presidencies of Bombay and Bengal by Louis Rousselet, 1845-1929. 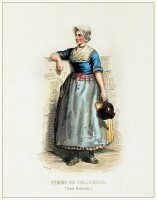 Netherlands costumes from Axel, Zeeuws-Vlaanderen, province Zeeland. 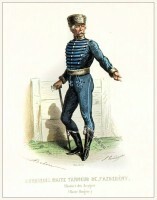 A captain in uniform from Jászsági, lower Hungary. Peasant from the Hateg District. Transylvania. This entry was posted in 1873, 19th Century, Asia, India, Traditional and tagged Dance costumes, Traditional India costumes on 8/29/13 by world4.